You can only imagine what is going on in the church and household of a popular Nigerian pastor, Apostle Suleman Johnson, following the scandal trending online between him and a lady whose father, a Reverend, described as a daughter who took after her mother's wayward ways. Anyway, Apostle Suleman's wife has reacted to the saga. I watch a video on my timeline this morning were his wife said she's a trained media person and it is clear to her that the Snapchat clips that were released of her husband in bed enjoying the sight of Stephanie Otobo's breasts are fake. She said she's being married to Apostle Suleman for 19 years and as a 'wise woman' she has not had any reason to suspect him of infidelity and that she's sure he's not promiscuous. She said her husband has a weakness, and that it is his desire to always help people. 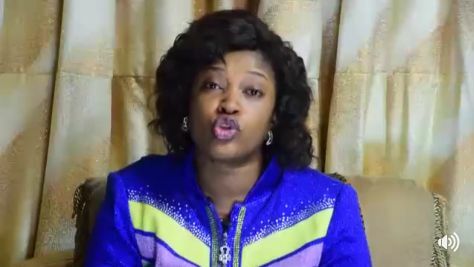 Mrs Suleman said people should not believe what they are reading online, insisting that Apostle Suleman only helped Stephanie and she decided to capitalize on that to try to tarnish his image.